Mindful Nutrition with Megan here! Today is my birthday and I’m celebrating in a healthier way! Try this cake batter dip recipe that takes you back to licking the spoon in your mom’s kitchen! If you didn’t like to lick the spoon this one isn’t for you! Celebrations like your birthday our a good time to use that word “moderation” when it comes to your food intake but some people like to take celebrations and make a whole week of it! This dip allows you to celebrate a little more than you would normally. 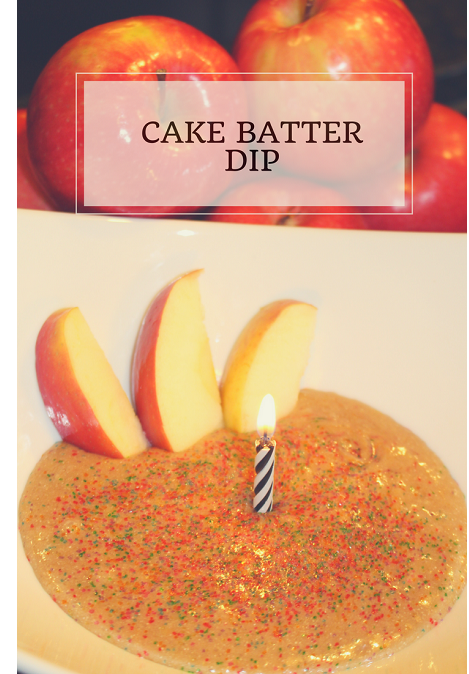 Just dip with apples and don’t skip on the sprinkles…they make it fun!! My sweetener of choice is pure stevia. Stevia is a natural sweetener that comes from a plant! Make sure you check the ingredients carefully because there aren’t very many true stevia options out there; most have another sweetener along with stevia. I prefer a liquid stevia dropper from Sweet Leaf and only have to use a few drops to get my desired sweetness! In a bowl combine mashed banana, CardioWhey, flour, granulated sweetener, and sprinkles until mixed well. In a microwave-safe bowl, melt nut butter and honey until combined. Stir in vanilla. Combine dry and wet mixtures in one bowl. Transfer to clean bowl and add sprinkles to the top! Dip with apple slices.